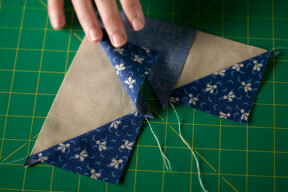 Here's our first super simple method for making a Flying Geese block. TIP: You'll avoid any bowing problems later if you cut the length of the rectangle on the straight of grain....or running along the same direction as the selvage. Lay one dark square on one side of the light rectangle, RST (right sides together). 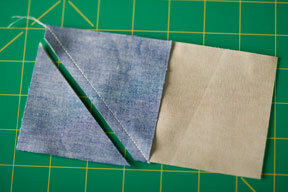 Using a fine tipped marker, draw a line from corner to corner, then stitch on that line. TIP:We highly recommend drawing the line first, to avoid any "wonkeyness" in your seam. Your eye can mislead you and you can end up with a seam that's not perfectly straight. TIP: No matter how fine your marker is, make your actual stitches just INSIDE of the line. This will keep your seam where it belongs. 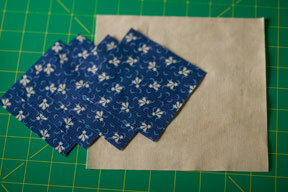 Trim off excess as shown, leaving 1/4" seam allowance. Press the seam to the dark fabric. If you're a newbie, check out our two minute Pressing Tip Video. Now place the second dark square on the opposite side of the rectangle, RST. Note the new square will slightly overlap the previous piece - that's okay! 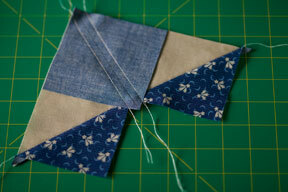 Mark your diagonal line and stitch on the line. 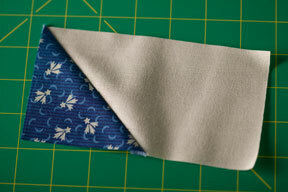 Trim off excess as shown, leaving a 1/4" seam allowance. 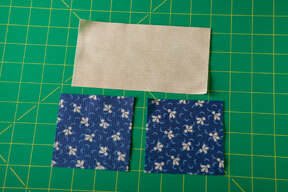 Press the seam allowance towards the dark fabric and you're done with one flying geese unit! 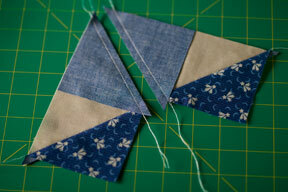 Now for our favorite quick method that yields 4 flying geese blocks with no waste! 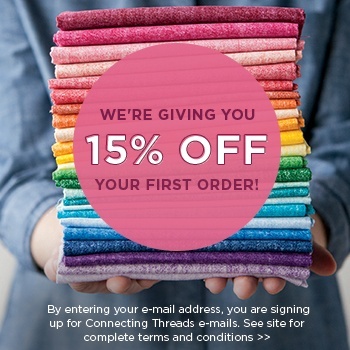 Start with the light fabric. 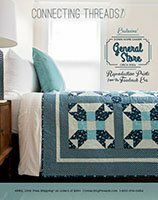 Determine what size you want your finished flying geese unit and add 1 1/4". We are making a 4 1/2" finished flying geese unit. 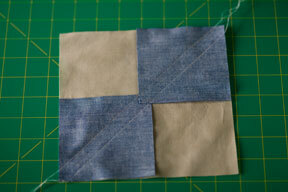 4 1/2" + 1 1/4" = 5 3/4" square of the light fabric. Cut one of these to yield 4 flying geese units. Now the dark fabric. Determine the finished height of your flying geese unit and add 7/8". Our finished height is 2 1/4", so 2 1/4" + 7/8" = 3 1/8" squares. 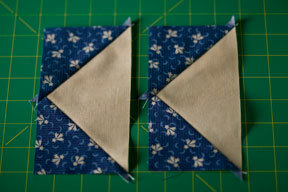 Cut four of these to yield four flying geese units. Draw a diagonal line on the wrong side of all of four dark squares. 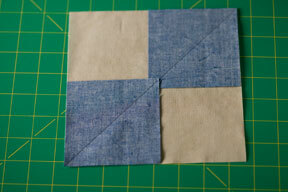 Lay two of the dark squares RST on the larger light square, as shown. Note, the dark squares will overlap slightly in the middle. Stitch 1/4" away from the marked line, through all the layers, as shown. Repeat on both sides of the marked line. Cut on the marked line and you'll have two units. 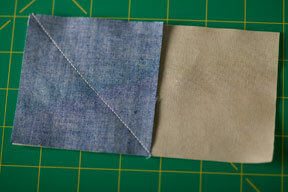 Press the seam allowance to the darker fabric. Repeat for both units. Set one unit aside for a moment. 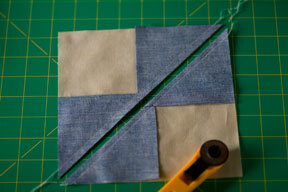 Lay one of your remaining squares RST on one unit. 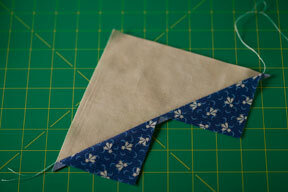 Note how it is lined up on the light fabric corner and will hang over slightly on the side with the dark triangles. Stitch 1/4" away from the marked line and repeat on the other side of marked line. See the flying geese peeking out?!!! 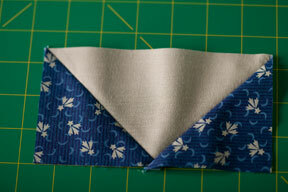 Press the seam allowance to the darker fabric and you'll have 2 finished Flying Geese blocks. Repeat with the other unit that you set aside and you'll have 4 Flying Geese blocks! 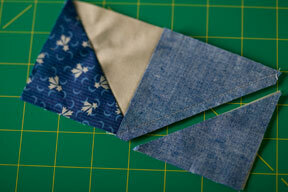 TIP: Before piecing these blocks together, trim off all the "tails" and "ears". 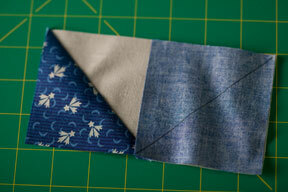 It's also a good time to remeasure and square up your block to see if your 1/4" seam allowance is accurate. If you don't trim off the little parts that stick out, your sewing machine needle could create a bump in the seam when it hits those areas.